These pieces are designed to be both practical and useful. The larger trinket boxes vary between oblong, square, octagonal and circular shapes, and there are three smaller square designs and a fan-shaped one as well. Two vases and a trinket tray complete the range. The trinket boxes are lined with good quality 28-count evenweave fabric, carefully chosen to match the colours of the cross stitched design, and the lids are slightly padded, while the vases are lined with felt rather than evenweave. These kits contain stitching and lining fabrics, wadding, plastic canvas (ultra stiff for the square and rectangular designs for added strength), DMC threads, needle, charts and full instructions. 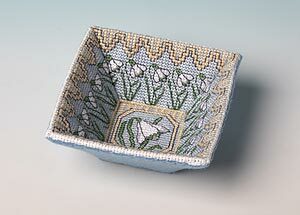 A cross stitch kit which makes a charming Snowdrop Trinket Tray, one of 2 snowdrop theme designs launched by Meg for winter 2018. The kit contains 16-count aida fabric, DMC stranded cotton embroidery thread, felt, plastic canvas shapes, needle, chart and full instructions. Flat rate £2.00 in total for orders for delivery in the UK and £4.00 in total for orders for delivery anywhere else in the world. However many items you order, this is the maximum postage you will pay. We accept payment by card, PayPal or cheque. Cheques must be in sterling unless the order is for £60 or more. See our terms and conditions for full details. WorldPay accepts payment in sterling, US Dollars and Euros. For approximate currency conversion XE.com Personal Currency Assistant.